BRRRR! Whoever said Africa is always warm! We finished our second expedition to the Makuni Chiefdom waking up to 30 degree temperatures in sleeping bags. – We attended a Church of Christ Sunday service (25 children/adults) held under 2 mango trees. Men sat on one side and women on the other on small benches and stools. Bev did a Bible lesson with the little children who had gathered before service started. We sang songs from hymnals written in Tongan. Jack preached the sermon and gave a mini lesson to the young men while the pastor interpreted. An older woman who said she was 100 years old (probably not, but she looked the part) received an instant healing as Bev prayed for her and she was able to rise, take a few tentative steps, and then broke into a dance they call the “Shaky, Shaky”! – After church we held a community soccer game with the local Zambians vs. our American mission team. Jack refereed the game and had a great time while getting lots of exercise running up and down the field! The Americans lost 4-2 on penalty kicks after a tie score in regulation time. We finished with joyful preaching and fellowship with the players and fans. – At the evening campfire meetings under the stars of the Southern Hemisphere, the things we will remember most are dancing and singing with the Africans, sharing the Gospel message, and praying for their needs afterwards. On one occasion a demonic spirit manifested in a young woman. As we prayed, she sank to her knees, leaned back, and gave a loud cry as the evil spirits left. Then her voice changed to its normal alto tone. Bev held her in her arms with her head on Bev’s shoulder until she was calmed and warmed in the cold evening air. – A group of preschool children joined our campsite with their mothers during the morning. Bev told them the story of Noah’s ark with lots of African animal imitations and noises. They so laughed at “Mama B”, Bev’s African name. Then she played the harp and turned them into one-finger angels from Zion (Heaven) as they strummed the harp strings and giggled. – On the last night, a 10 year old girl wrapped in her cotton chitange like a painting of Mother Mary came to Bev for prayer. She reached out and hugged Bev, and looked into her face with smiling eyes. They hugged each other even harder, not wanting to let go. – As Jack prayed for 2 guys with back problems, they were healed instantly by the power of God. Their countenances changed dramatically from ones of pain to elation, praise the Lord. – During a village dinner that was like a 4th of July picnic, Jack ate with the Headman of the chiefdom and his assistant. They both laughed hysterically when I showed them my 4 layers of clothes in preparation for the cold evening. The gap between our cultures was immediately bridged by the humor. The last 2 weekends our Overland Missions truck took our team to Victoria Falls to experience one of the Seven Wonders of the World. It is not hard to see God’s glory in such a site. 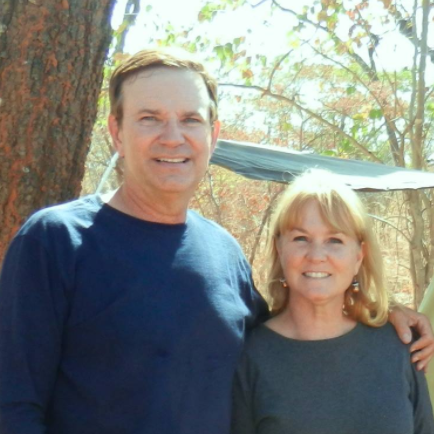 Next we camped in the Chobe Wildlife Preserve in Botswana. On safari we saw herds of Cape buffalos, giraffes, elephants, impalas, hippos, and even lions (26 species in all). At the campsite we were under strict instructions to stay in our tents as we could hear lions growling and hippos howling at night. We are thankful for all God is doing. Thank you for your interest and continued prayers. Posted on June 26, 2012 by fullersmission. This entry was posted in Afica, Newsletters and tagged adventure, africa, christ, god, learning, Trip, Weather. Bookmark the permalink.